Fairlook Lotion is an Ayurvedic formulation with ingredients like Aloe Vera Gel and Turmeric which are a perfect combination to give a clean and clear texture. FairLook plays a major role that lightens and brightens the skin while taking care of skin related problems. 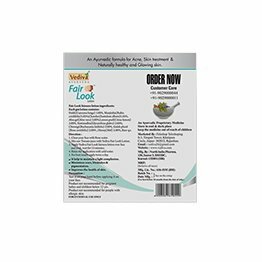 Fair look Lotion is an Ayurvedic formulation with ingredients like Aloe Vera Gel and Turmeric which are a perfect combination to give a clean and clear texture. Fair Look lightens and brightens the skin while taking care of skin related problems. It can be used by men, women & teens. 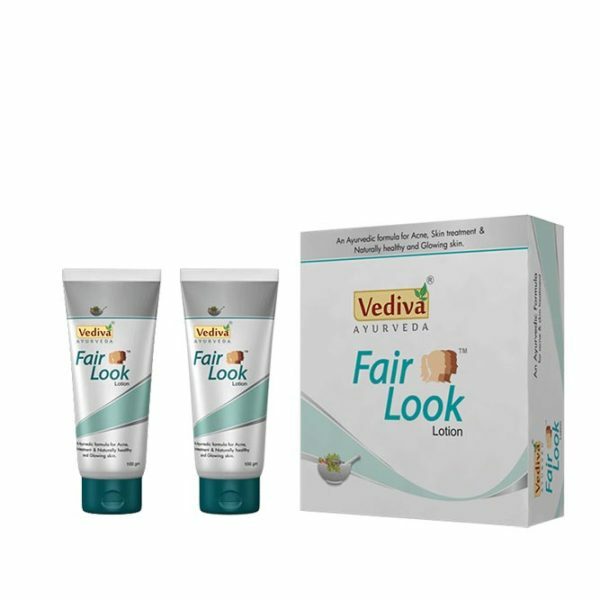 Fair Look Ayurvedic Lotion is formulated to lighten your dark spots and whiten your skin while nourishing it. Fair look helps to nurture and moisturize skin and help to reduce all flaws in your skin. It is useful to eradicate pimple marks, skin inflammation, sun-tan, limit scars, flaws, pigmentation, and, keeping up a light composition and an emanating sparkle on your skin. Daily exposure to pollution and UV rays leads to skin damage, uneven skin tone and darkening of spots. 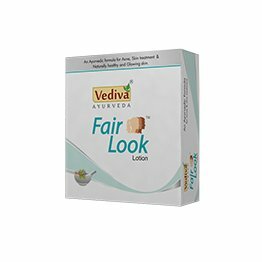 Fair Look lotion is the best ayurvedic lotion which helps to heal those damaged skin cells. The perfectly balanced mix of all necessary Ayurvedic herbs of Fair Look, the lotion helps heal skin. Along with it, Fair Look has Aloe Vera which also brings back skin’s healthy radiance. Sandalwood/Chandan further protect your skin from skin damage. Use every day twice to help heal skin and make it more fair, bright and spots free. Fairlook Lotion is used to remove pimple marks, reduce pigmentation, blemishes and scars, acne and sun-tan.The Ayurvedic Fair look Fairness Lotion provides you with radiant and glowing skin and helps maintain a healthy and light complexion. Fairlook is a natural blend of ingredients that are known in ancient Ayurveda to treat skin conditions, enhance the complexion and cure scars and marks. The lotion can be used on body parts that are more exposed to pollution, sun and other environmental factors mainly face, neck, arms and legs. Fair Look has been designed to use by men who usually have tough and rough skin and women who usually have soft and sensitive skin. Why 1000’s of customers like you choose Fair Look? ✓ Can be used on body parts. Fair look contains effective and natural Ayurveda herbs that reduce MELANIN, main reason for dark skin. hence works from outside bring fair and glowing skin outside. Turmeric has anti-inflammatory properties that calm the skin, reduces acne and acne marks. It heals wounds and reduces scars. The antioxidants in turmeric revive the skin and provide lustre and glow to the skin. The herb has antimicrobial, anti-inflammatory and antioxidant properties that soothe the skin, heal and relieve skin-related issues. It is considered one of the best herbs for the skin as it purifies the blood, removes dry skin and skin rashes. Regular use of Sandalwood (Chandan) reduces the appearance of scars and blemishes and promotes smooth and healthy skin. It helps to exfoliate the skin, remove sun-tan, and reduce the signs of ageing, dry skin and wrinkles. Aloe Vera Gel reduces skin inflammation and is successfully used for treating skin diseases like eczema, acne and psoriasis. It hydrates and moisturizes the skin without clogging the pores, lightens blemishes, reduces acne and the infections caused by acne. Lemon peel takes care of problems like dark spots, wrinkles, pigmentation, and is rich in antioxidants that help to detoxify the body. Regular use of lemon peel enhances skin clarity, and provides glow and softness to the skin and promotes the growth of new skin. Yashtimadhu (licorice) has antiseptic properties to heal skin conditions like redness. It improves skin tone, removes dark spots, dry skin, rashes and sunburns. It helps in skin whitening and fairness giving a flawless skin. It is used as a skin cleanser and moisturizer and is extremely good for removing pimples.It works as a cooling agent and guards the skin against prickly heat. Chironji improves skin texture, relieves itching, rashes, pain and various skin-related issues. Rose has therapeutic benefits that promote glowing skin, controls oil, cleanses and moisturizes the skin. Rose petals have astringent and antibacterial properties that work wonders for people with acne-prone skin. Honey is full of antioxidants that slow down ageing, it is antibacterial for acne treatment and it is incredibly soothing and moisturizing. Honey gives the complexion a boost and creates a glow. It helps increase tissue regeneration and healing and also decreases the signs of scars. Wipe your face with Rosewater making use of cotton. Blend 1 section Fair Look Lotion with two sections of fresh Tomato juice. Combine well. Apply the cream to uncovered body parts. Keep for 15 minutes and wash with cool water. Apply Fairlook twice daily to see signs of improvement. Precaution: Before applying test Fairlook Lotion on your hand. For individuals with sensitive and susceptible skin, it is not prescribed to use the product. Fairlook isn’t prescribed for individual below the age of 12 years and for pregnant women. I used this product for 2 months for pimples. I am quite satisfied with the progress. The product definitely worked for me. I used Fairlook for pimples. I used it for 1 months and my problem was resolved. I was looking for anything that could solve my pimple problem. I used had gone to doctor for treatment. Finally, I got relief from pimple with Fairlook product. Thank You Fairlook.. I used Fairlook lotion for my oily skin problem. I have the wheatish skin tone, but it looked like whenever I went out my skin appears dark. Fairlook has made my skin fair. Now even in my oily skin, I do not appear dark. Absolutely loved it…. 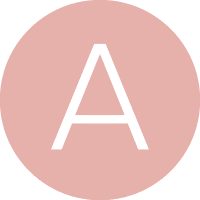 I would suggest everyone to use it…..
Been using this for quite some time and loved it. My rashes marks are lighter now. It has good ayurvedic properties and gives good moisturisation to the skin making my skin soft and smooth in a few days. I highly recommend this product because this lotion came and it became my favourite. I rarely use anything on my skin because of chemical but I am satisfied with the products as it is enriched with Ayurvedic ingredients. It solves many skin problems. I have been using this cream for two weeks now and already amazed by its result. Amazing product. Love the consistency of the lotion and the way it had worked on my skin reducing the breakouts and uneven skintone. True to it’s words it’s herbal and really works well for every type of skin. I have been using fairlook for past one month and the dark colour of my skin has become less. Best cream for fairness. Useful product for skin.